Alan Stern waited more than 17 years to see NASA launch a science mission to Pluto, and now that a spacecraft is safely on its way he knows much more time will pass before the data starts flowing back to Earth from that distant region of the solar system. 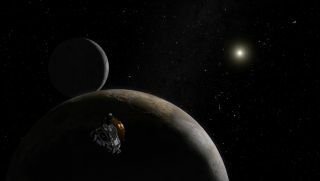 But now, at least, the countdown to that day--July 14, 2015--has begun as New Horizons makes it way toward an area of the solar system never visited by a spacecraft: Pluto, its moon Charon and the Kuiper Belt, which is home to thousands of unexplored objects. In the meantime, Stern, the executive director of the space science and engineering division at the Southwest Research Institute, is focused on successfully managing the mission, which took years to successfully finance and launch. A planetary scientist at the Southwest Research Institute's Boulder, Colo., office since 1991, Stern has participated in more than 20 space science missions and devoted much of his time studying the outer planets and the Kuiper Belt. From 1991 to 1994, Stern was the chair of NASA's Outer Planets Science Working Group, where he pushed the agency for a science mission to the outskirts of the solar system. When NASA decided to compete the mission in 2001, Stern said he immediately began gathering a team focused around members at the Southwest Institute and the Applied Physics Laboratory (APL) in Laurel, Md. Together, along with their collaborators in NASA, industry and academia, they developed New Horizons. Stern spoke about the development of the mission, his expectations and future plans via telephone and e-mail with Space News staff writer Brad Amburn. Space News: Ever since the 1990s several missions to Pluto have been proposed but quickly abandoned due to budgetary constraints. What made New Horizons less costly? Alan Stern: We made sure that the design and build/test effort of New Horizons was carried out by a relatively small, tightly knit team who stayed focused on requirements and paid close attention to ensure that we never strayed far from what was absolutely necessary to carry out the mission. We also recognized that the other key to fiscal responsibility was schedule responsibility, and executed on that with a "do whatever it takes" attitude to stay on schedule for the crucial January 2006 launch window. A lot of people didn't think it could be done, but that never discouraged us: In fact, we used it to motivate our troops. Would we have a spacecraft bound for Pluto today if not for the insistence of Sen. Barbara Mikulski (D-Md.) and others? Certainly not. Sen. Mikulski was crucial in our success; she is a strong and resolute advocate for the space sciences and the scientific community is very lucky to have her in office. Her colleagues -- of both parties -- were also key. And so was the high-priority ranking the mission received from NASA advisory committees and the National Academy's Planetary Decadal Survey. And we would never have gotten to launch without some expert steering by [APL scientist] Tom Krimigis and [APL Director] Rich Roca, who helped navigate the mission through venomous political waters in 2001 and 2002. New Horizons also is a testament to hard work and persistence by hundreds of scientists, engineers and technicians -- virtues that will serve us all well as we continue the robotic exploration of the planets and turn human spaceflight to undertake field exploration of the Moon and planets. The plutonium used aboard New Horizons to fuel the battery sparked some environmental concerns if the spacecraft were to suffer a launch failure. What was your reaction to these criticisms? I was frankly surprised at how little opposition there was. I think that was in great measure because NASA went to extreme lengths to ensure that both our RTG [radioisotope thermoelectric generator] and our launch vehicle were as safe as good engineering could make them, and I think that care really paid off. NASA's insistence on openly communicating the small residual risk of such a launch was also very important. [NASA Administrator] Mike Griffin and his team deserve a great deal of credit for leading the agency through this process to a very important success for both space science and frontier exploration. New Horizons is expected to reach Pluto in 2015. What are you planning to do for the next decade? I will be busy leading New Horizons through the flight mission, serving in my role as principal investigator of NASA instruments aboard Rosetta and the Lunar Reconnaissance Orbiter (LRO), doing research in planetary science, and helping to make the Southwest Research Institute the premier planetary exploration research organization in the United States. I also hope to get involved in some new aspects of both robotic and human space exploration, and am looking forward to doing some public speaking about the values of space exploration for 21st century America. Any expectations on what New Horizons will find? I'm not in the business of making predictions about what we will find because the most important lesson of first-time planetary reconnaissance missions has been to expect the unexpected. New Horizons is headed to a fundamentally new type of planetary body -- an ice dwarf -- and a binary ice dwarf at that. I expect nature will have more than a few surprises in store for us when we see the data sets arriving from the Pluto-Charon system in early 2015. She always does. That's part of the lure of being in this line of work. What are your most serious concerns about the mission? NASA has almost $700 million invested in New Horizons, and it's a very highly visible demonstration of U.S. space leadership. We need to ensure that we don't screw up the mission we've worked so hard to sell, build and launch by cutting corners in how we operate it. As I have said many times, it's our job on the project to be good stewards of New Horizons as it makes its crossing of the solar system. Likewise, it is NASA's role to ensure that the project has the resources to conduct the flight mission safely and at low risk. By the way, I believe that Drs. Griffin and [NASA Science Associate Administrator Mary] Cleave intend to do just that. Now that New Horizons is on its way to the solar system's outermost planet, what do you believe is the next step for NASA in planetary exploration? Just speaking for myself, I think the return of people to the Moon has a lot to offer for understanding the formation and evolution of terrestrial worlds; so would the exploration of near-Earth asteroids by people. As to the next thrust in robotic missions, I think the most important mission to do would be an in-depth mission to study Saturn's moon Titan. I consider it the "belle of the ball" in our entire solar system for what it can teach us about active worlds, complex atmospheres and the chemical origin of life. If that turns out to be beyond our fiscal reach, as the once-ballyhooed Europa orbiter has become, then I think we should take on moderate cost (New Frontiers) flyby reconnaissance missions to follow up at Uranus and Neptune on the eye-opening discoveries of the Voyager mission. With all the dramatic capability that modern instruments give us, even flyby returns to the outer planets can dramatically advance our state of knowledge. Such missions can also allow us to visit additional Kuiper Belt objects, satisfying the top-priority recommendation of the Planetary Decadal Survey. And for one of the hottest issues at the International Astronomical Union: Pluto; planet or not? Of course Pluto is a planet: It's massive enough to have its shape controlled by gravity rather than material strength, which is the hallmark of planethood. I think it's exciting that we're discovering whole new classes of planetary bodies like the ice dwarfs, of which Pluto is the charter member. Who knows? Perhaps even more exotic classes of planets will be discovered soon. But we learned long ago that dogma isn't where it's at in science: being adaptable to new data and new ideas is. That's what Copernicus and Galileo risked their reputations for. Discovering that our solar system has many more planets than we ever expected, and that most of them are ice dwarfs rather than like Earth and the other rocky terrestrials, is just another step in the revolution in viewpoint that removed the Earth from the center of the physical universe and makes Earth all the more special.